Too often, information related to Gold & Silver IRAs focuses on the best types of bullion, on the latest world news impacting the prices of gold, silver, platinum or palladium, on which companies to use to establish a precious metals IRA…etc. Everyone is guilty of it from time to time. Sometimes it is better to get back to basics. Just the title precious metals IRAs can raise a lot of questions. What exactly is an IRA? How are precious metals IRAs different? Why should I set one up? Which precious metals can I add? How do I add them? Do I physically hold the metal? Can I hold non-metal assets inside of one? Are they taxed differently? The list goes on and on, but I trust that you get the point. Well, today I felt like it was necessary to slow down a little bit and provide a quick rundown of some of the most important questions related to a Gold IRA or other precious metals IRAs. Some of this may seem obvious to the savvy investor. But savvy investors aren’t the only people who can benefit from precious metals IRAs. 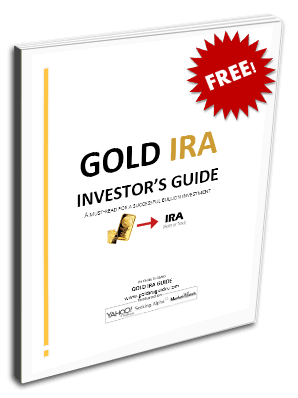 The Gold IRA Guide is a resource for anyone looking for financial security and success. An IRA, or Individual Retirement Account, is a tax-advantaged retirement savings plan that is designed to encourage American citizens to invest towards their life after work. The Internal Revenue Service provides special tax benefits to money contributed to an IRA, although the specific tax treatment varies among the different types of IRAs. To be eligible to open and contribute to an IRA, you must receive income from a job or alimony. Income from investments, pension or annuities do not qualify. How are Precious Metals IRAs different? This can be a bit of a misnomer; the term “precious metals IRA” does not refer to a unique and separate type of IRA (for instance, for tax implications, Traditional IRAs are unique and separate from Roth IRAs or SEP IRAs). Rather, a precious metals IRA is established when qualifying gold, silver platinum or palladium bars/coins (bullion) are added to a new or existing IRA. The only restriction is that the IRA must be “self-directed” after adding bullion. In a self-directed IRA, you choose which assets will make up your portfolio rather than your plan’s custodian. After adding precious metals to an IRA, all of the pre-existing rules associated with the account are still in effect. The only differences are the extra rules that come along with the metal. Which precious metals qualify to be added to an IRA? The IRS only allows a small range of coinage inside of an IRA. Initially only American Eagle gold or silver coins were allowed. In 1997, new legislation allowed a broader range of bullion. How do I add precious metals to my IRA? The first step is always to check to see if your existing IRA qualifies. If not, open a new IRA that does (you can roll over existing IRA / 401(k) funds into a self-directed precious metals IRA). The next step is to identify and purchase the IRA-eligible coinage. Contact us today for more information on how to set up or add to a precious metals IRA. After purchase, it is time to ship out your bullion to a precious metals depository for holding. Please settle on your depository before the actual purchase of your precious metal coinage. This way you can ship right away. Where are the precious metals physically held? Any precious metals inside of an IRA are required, per IRS rules, to be held in an approved depository. This is essentially a warehouse for valuables. Your depository is charged with the safekeeping and maintenance of your bullion. There are two kinds of depositories – allocated or unallocated. Allocated depositories work like a safety deposit box, meaning that your exact precious metals are held in your name. Unallocated depositories store all like metals together, not necessarily by owner. When distributed, a metal of identical specifications will be shipped out, but it will not be the exact coin or bar that you purchased. Can I hold other investments (stocks, bonds, mutual funds, etc) inside of my precious metals IRA? Yes. Your existing portfolio can be rolled over into a precious metals IRA, and you may add or remove investments just as in any other IRA. You will not incur any new taxes or penalties for rolling over your IRA into a precious metals IRA. Are Roth IRAs eligible to hold precious metals? Yes, both Traditional and Roth IRAs can become self-directed precious metals IRAs. For the differences between a Traditional and Roth IRA, you should read a quick rundown from Investopedia. Are precious metals IRAs taxed differently? No. Your precious metals investments have the same tax advantages that other investments receive inside of an IRA. This means that bullion investments inside of an IRA are taxed differently that bullion investments inside of a non-IRA, taxable account. Are there minimum purchase requirements to set up a precious metals IRA? There are. The minimum purchase amount to establish a precious metals IRA is $5,000. Any subsequent investments must be at least $1,000. Why should I set up a precious metals IRA? 1)Your IRA will provide you with a tax-advantaged savings vehicle for the future. 2) Your IRA is self-directed, giving you full control of your retirement investments. 3) Precious metals will add crucial diversification and can help protect your nest egg against severe economic distress. For a more in-depth look at the advantages of setting up a precious metals IRA, review our Why a Gold IRA page. Request a free Gold IRA Investor’s Kit today to begin!